Basic Christian principles require the community to provide protection for the poor and vulnerable. Our parishes and Catholic Charities witness the high cost of being poor every day as we assist families forced into alarmingly high debt when they take out a payday or auto title loans to cover an unexpected expense. In the teachings of our faith we have many warnings about usury and exploitation of people. Lending practices that, intentionally or unintentionally, take unfair advantage of one’s desperate circumstances are unjust. Catholic Social Teaching demands respect for the dignity of persons, preferential concern for the poor and vulnerable, and the pursuit of the common good. These principles coupled with our teaching on economic justice guide our questioning of current payday lending practices and the formation of our Basic Principles for fair lending practices. Across the state, my brother bishops have supported zoning and regulatory ordinances passed by more than 17 cities like Dallas, San Antonio, Austin, and Houston in order to provide some basic protection for consumers. We recognize that ordinances and legislation are not the only solution. Several parishes and Catholic social outreach programs in Texas are working with credit unions and other interfaith partners to develop alternative lending programs with interest rates between 3% and 20% APR. On behalf of my employees in the Diocese of Brownsville, we have joined the Community Loan Center so that our employees are able access short term loans at realistic rates and with realistic repayment schedules. More will be presented on this program later today so that you may consider it as a part of the solution going forward. Bishop Joe S. Vasquez testified in support of HB 2019, Rep. Craddick's bill "relating to a limitation on the total charges in connection with certain extensions of consumer credit facilitated by a credit services organization." The testimony was part of a House Investments and Financial Services Committee meeting, April 15, 2013. 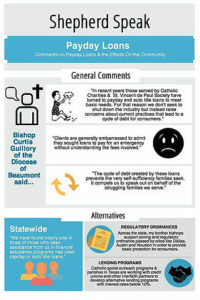 On Jan. 22 2014, Bishop Curtis Guillory hosted Beaumont city leaders for a discussion of the impact of payday and auto-title lending in the area. Community leaders gathered at Catholic Charities of Southeast Texas in order to explore alternative loan products and possible city action to protect consumers from usurious lending rates. Following the educational sessions, listening sessions were conducted with non-profit case mangers.